There are three layers in every hair including the inner, the middle, and the outer layer. When your hair cuticle is damaged, your hair will be dry and luster. Your hair also looks breakage, the scalp is itchy, and the elasticity is little. Damaged hair is caused by a lot of reasons including soaps, alcohol, hot climate, dryers, styling, sunlight, swimming, lack of moisturization, chemical use, stress, low quality of pillowcases, etc. 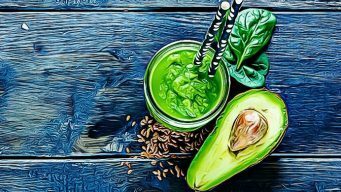 Actually, you can find out a lot of hair conditioners, hair shampoo on the market but you should read this article completely, VKool.com will show you top 27 DIY hair conditioning treatments for treating damaged hair. Now reading and give a try to get a shiny hair. Warm up some teaspoons of olive oil and apply it on the scalp. Massage your hair for some minutes and use a towel to cover the hair. You leave it for 30 minutes or over the night if necessary. Then you wash off with shampoo as usual. You should do this method just once per week. You mix ¼ cup of honey, ¼ cup of olive oil and warm it up. Then you apply the mixture to your scalp and leave it for 30 minutes before you rinse off with lukewarm water and shampoo. You can do this treatment once or twice weekly. You mix some teaspoons of olive oil and ½ mashed the ripe avocado. Then you put a blender and blend until it is smooth. Now you apply the mixture on your hair and leave it for 30-45 minutes. Wash off with shampoo as usual. You also can mix coconut milk, an egg yolk, and a mashed ripe avocado. Apply the mixture on the scalp and massage it for 5 minutes. Leave it for 45 minutes before washing off the hair with shampoo and lukewarm water. You just need to whisk the egg and apply it on the scalp. Massage for some minutes and cover your hair with a shower cap. Then you rinse off with shampoo and cool water. You also can mix 1/2 glass of plain yogurt, an egg, and a tablespoon of almond oil. Stir it well and you apply on the scalp. Massage your hair gently and cover a shower cap on the head for 30 minutes. Now you can wash off the hair as usual. You just apply some aloe vera juice on your hair and leave it for 20 minutes. Then you wash off with warm water and shampoo. You mix some tablespoons of yogurt, coconut oil, and some tablespoons of aloe vera gel. Stir it completely and apply on the hair. Massage the scalp gently and leave it for 30 minutes before rinsing off with shampoo and water. You should do this remedy once per week. You apply warm coconut oil on the scalp and massage it. Cover your head with a shower cap and leave it over the night. You wash the hair in the next morning with shampoo and lukewarm water. You mix ½ cup of honey with some tablespoons of warm coconut oil. Blend it completely and apply it on the hair, massage for some minutes. Leave it for 30 minutes before rinsing off with warm water. You can apply this method once or twice weekly. You mash a banana and apply it on your hair. Massage your scalp several minutes and leave it for 45 minutes before washing off with lukewarm water and shampoo. You also can blend some ripe bananas with a tablespoon of olive oil, coconut oil, and honey. Then you apply the mask on the hair and leave it for 30 minutes. Now you can wash off your hair with warm water. You heat several hibiscus flowers in a glass of coconut oil. When it is charred, you strain and cool it down. Then you apply the mixture on the hair and massage for some minutes. Now you leave it for 30 minutes before rinsing off your hair. You also can grind some hibiscus leaves and some hibiscus flowers with water. Apply the mixture on the hair for 20 minutes before you wash off with lukewarm water. You put a black tea bag in a cup of boiling water. You cover and steep it for 10 minutes. Now you add some drops of essential oil and cool it down. Now you apply it on the hair and leave it for 15 minutes. Lastly, you rinse off with the mild shampoo and warm water. You can apply this treatment once or twice weekly. You add ½ cup of honey with some water. Now, you apply it on your hair and leave it for 30 minutes before rinsing off with warm water. You can do this treatment twice per week. You mix a tablespoon of coconut oil or olive oil, a tablespoon of yogurt, and some tablespoons of honey. Mix them well and warm the mixture. You apply the mask on the hair and cover with a shower cap. You leave it for 15-20 minutes before rinsing off as usual. You should apply this treatment if you want to lighten your hair. You mix some cups of water with a cup of white vinegar. After conditioning, you use it to rinse your hair and sit for 5 minutes before rinsing off with lukewarm water. You can apply this remedy once per week. Firstly, you warm some butter. Then apply it on your damaged hair and use a shower cap to cover the hair. You leave it for 30 minutes before shampooing as usual. You mix a teaspoon of apple cider vinegar, some tablespoons of olive oil, and some egg whites. You stir it well and apply the mask on the hair. Cover your hair for 30 minutes and then you rinse off with shampoo and water. You prepare a glass of pumpkin puree and add some tablespoons of honey in it. Rub on the scalp and massage gently. Then you leave it for 15 minutes before rinsing with shampoo and water. You should do this method twice per week to get the best result. You mix some tablespoons of cocoa powder, plain yogurt, a teaspoon of apple cider vinegar, and a teaspoon of honey. Apply the mixture on the scalp and massage it gently. Leave it for 30 minutes before you wash off with water and shampoo as usual. You combine some chamomile tea and lemon juice. Then, you apply the mixture on your wet hair. Leave it for 10 minutes before washing off with water and shampoo. You can do this method once per week. Firstly, you mix some sugar into a cup of water. Pour it into your palms and apply on the hair. Massage it gently and leaves it for 15 minutes. You rinse off with water and shampoo. You need a cup of beer and ½ cup of apple cider vinegar. You mix all the ingredients to gather and pour the mixture on your scalp. Leave it for 5 minutes and rinse off with warm water. It is so terrible if your hair is usually broken and fallen. Do you know that mayonnaise can be used to take care of your dried hair? The ingredient is made of egg, white, and oil so it is very beneficial for hair care. Here is the direction how to use mayonnaise for your scalp. You just need to mix some tablespoons of honey with the ½ cup of mayonnaise. Then you apply the mixture on your hair. Massage the scalp for some minutes and leave it for 30 minutes. Now, you wash your hair with shampoo and water as usual. Oatmeal is really good for health, hair, and skin. You can buy it in the supermarket, grocery stores to make delicious recipes and take care of your hair. You should mix ¼ cup of oatmeal, ¼ cup of milk, and some teaspoons of almond oil or olive oil. Stir it well and apply the mixture on your hair. Cover the hair for 30 minutes before you shampooing as normal. You mash a small papaya and mix it with ¼ cup of yogurt. Stir until it gets consistent. Now, you apply the mask to your hair and leave it for 30 minutes. Then, you rinse off with shampoo and water. Firstly, you boil a cup of water and add some tablespoons of flaxseed on it. Stir it well and continue to boil until it gets consistent. Now, you strain the gel, cool down and You can add some drops of essential oil. You apply it on the scalp and leave it for 30 minutes before washing off with water. You soak some tablespoons of seaweeds in the water until it gets tender. Then, you add a tablespoon of olive oil, yogurt, and some mashed avocado. Blend all the ingredients and apply it on the scalp. Then, leave it for 15 minutes before you wash your hair as usual. You need some teaspoons of rosemary oil or lavender oil, a teaspoon of vitamin E oil, ¼ cup of olive oil, and a cup of shea butter. Heat the shea butter into a saucepan. Add olive oil and cool it 30 minutes. Then, you add vitamin E oil and another oil. Now, you whip the mixture until it is consistent. Now, you apply the mixture on the scalp and massage it for some minutes. Leave it for 30 minutes before washing off the water and shampoo. Like other hair conditioning treatments such as coconut oil, rosemary oil, olive oil, jojoba oil is a beneficial ingredient to your hair. You need a cup of water and some drops of peppermint oil. You mix all the ingredients and apply on the scalp when the hair is wet. You mix some tablespoons of olive oil and some tablespoons of coconut milk. Then, you apply the mixture on the hair and leave it for 30 minutes before rinsing off as usual. You should do this method once or twice per week. You mix a tablespoon of baby oil and an egg yolk. Stir until it is smooth, hence, you apply the paste on the hair. Massage for some minutes and leave it for 30 minutes. The last step is to wash your hair with shampoo and water. Do you like yogurt? This is the good news for you that yogurt, like other hair conditioning treatments, will benefit your damaged hair. You prepare a tablespoon of castor oil, a tablespoon of coconut oil, and a cup of yogurt. Then you apply the mixture on the scalp and massage gently. Now you leave it for 30 minutes before washing off with water and shampoo. You might visit our main page to get more useful information about Hair Care After reading the article about top 27 DIY hair conditioning treatments, I think that you have learned a lot of useful methods to take care of your damaged hair. If you have any question, please leave your comments below.